American Rust, a new exhibition by musician John Rowley, will open at the Dorothy Pax on 1 September. The exhibition is a collection of artwork created by John Rowley. Formerly of Red Guitars fame, John was creating artwork for new band Ten Million Aliens’ new album, Road Trip (Fall of the Rebel Angels). 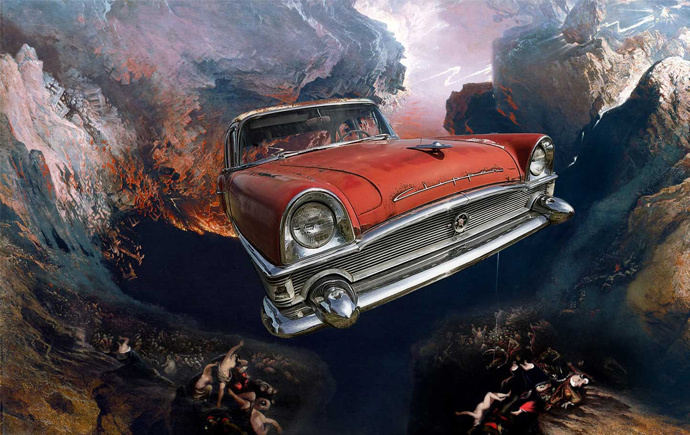 Taking iconic American cars from the 50s and 60s, he incorporates them into strange landscapes from old paintings by Turner, Martin and Bruegel with help from band mates John Senior and Rich Banks. John’s new band artfully mix politics with pop music, with Donald Trump and the rise of the right bearing the brunt of this new album. Speaking of the exhibition, John said: “The original working title of the album was American Rust and early ideas involved cutting out images of old junkyard American cars and placing them in different empty deserted landscapes. American Rust opens at the Dorothy Pax on 1 September and is free entry. Head to facebook.com/10millionaliens for more information.